Promotional poster from the film A Genesis Found. Still photo from the film A Genesis Found. Promotional poster from the film A Genesis Found. All pictures used with permission of Wonder Mills Films. FAYETTEVILLE, Ark. – Mullins Library at the University of Arkansas will host a stop on the 2010-11 Southeastern Campus Tour for the independent feature film, A Genesis Found. A Genesis Found, a sci-fi/adventure film produced by Wonder Mill Films, deals with the purported discovery of an anomalous skeleton at the Moundville, Ala., archaeological site, a metropolis of prehistoric North America. A Genesis Found will be shown at 7 p.m., March 17, in Room 104 of Mullins Library. The film’s fictional plot focuses on a 1938 discovery by anthropologist John Patton Jr. (Bennett Parker) of an anomalous skeleton that is neither animal nor man. Uncertain of its implications, Patton hid the discovery away from the world. Seventy years later, his grandson Gardner (Elliot Moon) is forced to come to terms with his grandfather’s past when his cousin, controversial documentarian Bart Thompson (Luke Weaver), arrives for a seemingly routine film shoot. Gardner soon learns that Bart isn’t back just to shoot a movie — he wants to find the “discovery” their grandfather buried nearly 70 years before. The Southeastern Campus Tour is a unique film distribution model, avoiding the traditional “festival” distribution of most independent films. Wonder Mill Films and writer/director Lee Fanning hope the regional appeal of the film, and their personal approach of bringing it directly to audiences, will get film fans and students excited about the possibilities for the DIY (do-it-yourself) model in the region. Fanning will attend the screening. He said he hopes that all audiences, even those who could care less about supporting regional cinema or a fresh distribution infrastructure, will be attracted to the film for its traditional, yet unique, handling of its adventure/mystery plot. The free screening is open to both students and the community at large, although seating will be limited. The first 50 in the door will receive a free promotional DVD. Copies of A Genesis Found on DVD and A Genesis Found: The Film Companion (its book accompaniment) will also be on sale. The 71 stops on the campus tour have included major and minor colleges and universities in 11 states: Alabama, Georgia, Florida, Tennessee, Mississippi, Louisiana, Texas, Kentucky, Arkansas, South Carolina and North Carolina. Photos and personal perspectives of each screening will also be covered by the tour’s official blog, Son of Arkie (sonofarkie.com). For more information on the tour or the film, including a trailer and clips, or to purchase the DVD and book, visit agenesisfound.com. 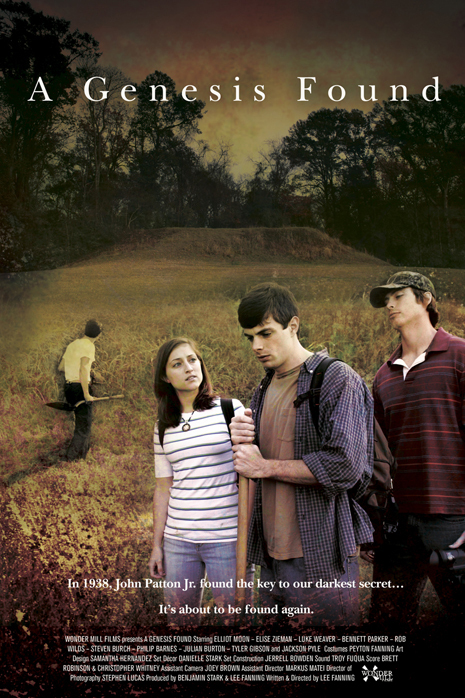 Wonder Mill Films was founded in 2006 by Benjamin Stark and Lee Fanning and is based in Huntsville, Ala. A Genesis Found, their first feature, was produced in the summer of 2008, began a festival run in 2009, and was released on DVD in 2010. Their second feature, The Nocturnal Third, was produced in the summer of 2009 and will enjoy a limited theatrical and DVD release in April 2011.